Martin Scorsese better know for intense and violent films about unsavory characters has created the most beautiful and lyrical ode to the art of motion pictures based on Brian Selznick's novel “The Invention of Hugo Cabret” from a screenplay by John Logan. Scorsese had wanted to inspire his 12 year old daughter and make a movie that she can actually watch. And for once the 3D effects brings the scenes to life and is worth the price of the glasses. Cinematographer Robert Richardson with the visual production team led by Dante Feretti has created soft edges with a half digital and half real 1925 Parisian train station. Each frame is like luscious post card that you want to keep with you forever. Hugo ( Asa Butterfield) was the motherless son of a clockmaker (Jude Law) who teaches him the art of tinkering with machines. While working on a broken automaton at the museum the father is killed during a fire. His drunk uncle Claude takes Hugo to the train station where he keeps the clocks working teaching him all he knows. 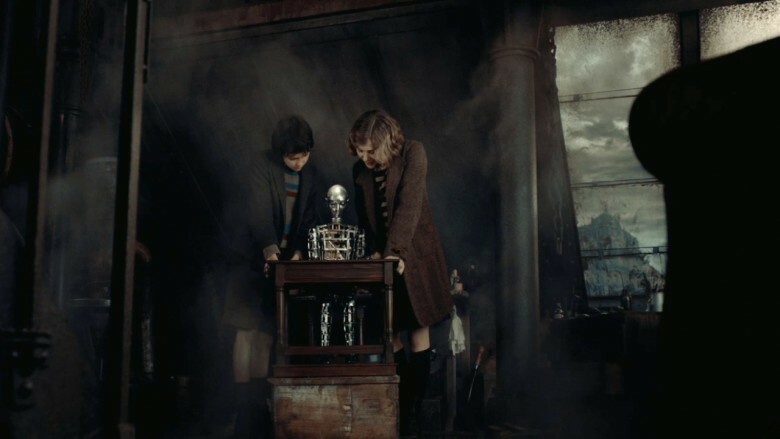 Although this means that he can no longer attend school Hugo watches the world from his various vantage points coming down for food or stealing tools and little machine parts to fix the automaton hoping to finish his father's work. Living in a long forgotten apartment in the clockworks, he keeps the machines running hoping they won't come looking for his uncle who had suddenly disappears He keeps himself secreted so that he isn't taken to the orphanage by the station inspector Gustav (Sacha Baron Cohen) and his Doberman. Gustav keeps the station free of stray children while he yearns for the flower stand girl Lisette (Emily Mortimer). One day he gets caught by grandpa Georges (Sir Ben Kingsley) at the toy shop who discovers the book Hugo has in his possession and threatens to burn it. He follows the old man home where he enlists the help of his granddaughter Isabelle (Chloë Grace Moretz). Despite her worldliness Isabelle is sheltered like Hugo. Her world is books, so her speech is like bits of dialogue from novels. Hugo has a hard time explaining what he feels. He only knows he has to get the book back. Isabelle believes they are destined for a clandestine adventure. The story meanders from the main point while it watches the sweet romance of Madame Emile (Frances do la Tour) the cafe owner and Monsieur Frick (Richard Griffiths) the newspaper seller. It lightly explores the angst of Gustav who wants to woo the pretty Lisette but is stymied by the brace on his leg from a war injury. There's the slapstick chases of Gustave, the dog and Hugo that will amuse the younger kids who will get lost after automaton's secret is revealed. Isabelle could never understand why her grandfather never allowed her to attend the movies. So Hugo sneaks her into a film of Harold Lloyd hanging on to the clock hands on the side of a building. Later being chased by Gustav he finds himself in the same predicament walking the line between movie and reality. As Hugo and Isabelle discover her grandfather's legacy the movie shifts gears by giving the audience a reintroduction to the wonders of early film. Not only enlightening the older generation in a appreciation from where and how movie all started, but also for the new audience of young people who haven't got a clue. Hugo tells Isabelle that movies are “special place where you can see dreams in the middle of the day”. And this film is a gift of a very special dream.